Most leases and rental agreements include a stipulation that your apartment should be clean upon vacating. 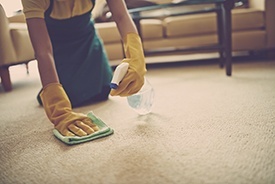 This condition may seem somewhat vague, raising the question of how clean is "clean?" Use the apartment's move-in condition as your yardstick. It should be as clean or cleaner than when you took possession of your home. Here is a checklist of some areas that need special attention. Remove and wash all the refrigerator shelves and drawers. Wipe down the interior with a mix of water and baking soda to remove odors and food stains, then rinse with clear water. Dry the shelves and drawers before returning to their places. If you use a commercial product to clean the oven, put on gloves and goggles before you begin. Read the directions carefully and follow them to the letter. A solution of baking soda and water also works as a more eco-friendly solution for ovens. The dirtier the oven, the thicker the mixture should be. Wipe down the inside and outside of cabinets along with all countertops and appliances. Sweep and mop the floor. Include the areas under the stove and refrigerator, taking care not to mar the floor when you pull them out. Remove soap scum from sinks, tubs and showers, paying special attention to faucets, handles and shower heads. There are a number of effective methods to clean grout, depending on the severity of the stains. Thoroughly clean the toilet bowl and exterior. It may be easier to replace the toilet seat if it's too difficult to clean properly. Remove all nails, picture hangers and any other items in walls, ceilings and doors. Erase-A-Hole is a handy way to repair minor nicks or holes. Larger holes may require some spackle and touch-ups. When it comes to removing scuff marks from walls, Magic Eraser lives up to its name. Be sure to test a small patch first to make sure it doesn't damage the paint. Clean dust magnets like window blinds, ceiling fans and light fixtures. Don't forget about switch plates and heating vents. Vacuum all carpeting, applying stain remover as needed. Ask for a pre-move-out inspection. The property maintenance team will likely see things differently than you do, and may ask you to touch up other areas. Finally, be sure to take pictures once you're finished. The return of your security deposit may depend on it. If you have any questions, stop in to our Springs leasing office for help from our friendly management team!